The World Bank will undertake a series of development projects covering the North and East and other areas worth over US$ 900 million, its Country Director Naoko Ishii said. 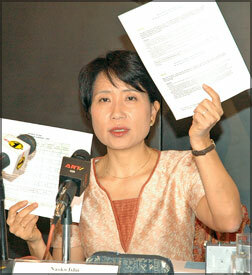 She said they have development projects which are in the pipeline till 2012. They will cover development projects nationwide covering the North, East and other areas. She said these projects will cover a series of development activities covering areas including dam safety and water resource planning, integrated community development, national and provincial road development, irrigation, maintenance and water resource management, general education and health sector development being are some of them. Ishii said that despite the conflict situation in the North and Eastern part of the country, World Bank has been funding major agriculture projects in the country because nearly two-thirds of the pre-war population depended on agricultural farming, livestock raising and deep-sea fishing for their livelihood. “With the conflict came damage to irrigation schemes, callapes of village level institutions such as farmers’ organisations, loss of rural market access roads, mass displacement of the people, all resulting in a substantial decline in agricultural production,” she said. Ishii said food security was ensured for about 33,250 conflict affected people including those returning who had been displaced in 396 villages in the project region. This was achieved through the rehabilitation and restoration of productive capacity of about 369 small irrigation schemes, which brought about 21,944 hectares of pre-war farmlands back into cultivation. The Country Director also said that since they we have received a number of questions regarding the conflict sensitive approach taken in the Country Assistance Strategy in early October was a proposed programmes for the conflict affected areas as well as concerns about World Bank engagement with the Eastern Provincial Council. She said that the tense situation has been a major obstacle to the longer development. It permeates every aspect of the society, including the results of development assistance. But we cannot wait for the conflict to be over; rather we need to address conflict driven needs in a more systematic manner”, Ishaii said. She also said to make that event successful, an instrument called conflict filter has been developed to keep them alert to conflict sensitivities. It is a list of questions to ask us consistently as we plan, develop projects with official counterparts and supervise ongoing efforts. This filter is most clearly applicable when we support work areas directly affected by conflict and also will work across Sri Lanka,” she said.